Sony has expanded its Bloggie MP4 camera portfolio with new stylish, pocket-size Sony Bloggie Touch HD camcorder, which features an 3-inch capacitive touchscreen display, F2.8 wide angle lens with 4x digital zoom, Exmor CMOS sensor, SteadyShot image stabilization, Face Detection, Auto-Macro mode, HDMI output and integrated USB arm, capable of capturing 12.8-megapixel still shots and 1080p (1920 x 1080 pixels) full HD MP4 video with a single ultra-compact device, available in 2 variants of color – silver and black. 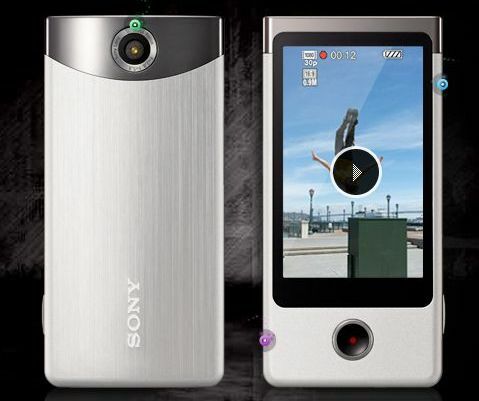 One of the most notable features for Sony Bloggie Touch is the large, vivid 3″ display that can auto-rotate for vertical or horizontal shooting/viewing according to how you’re holding the video camera. In addition, the Bloggie Touch also allows for easy sharing of HD videos and photos to popular social networking sites including Facebook, Flickr, Picasa Web Albums and YouTube. Sony Bloggie Touch will be offered in 2 model – Bloggie Touch MHS-TS20 (8GB internal memory) and MHS-TS10 (4GB on-board memory), slated to hit the market in coming October for around $200 and $180, respectively.